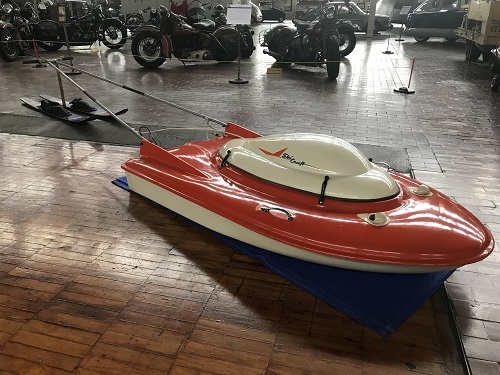 This little 6 ½’ long ski-tug was produced in Hamburg, Germany for the leisure market in Europe and the US, and was quite popular before the popularity of more mainstream personal watercraft. 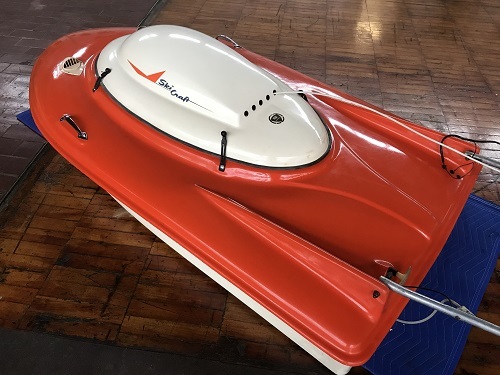 Introduced in Europe in late 1962, they were not allowed in the US until an amendment to most states’ boating laws allowed them. Up to that point, an observer or mirror was required for any water craft pulling a skier. 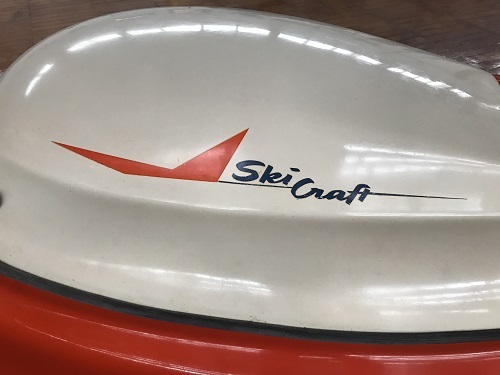 Ski Craft devised a “deadman” switch for the control handlebar – releasing it would cut the ignition and stop the boat within twelve feet, making it safe enough for our waters. This 24hp engine was the first large-scale production of a rotary. 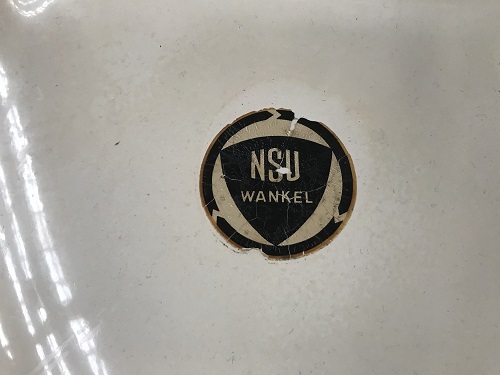 The clever design incorporates a swing-down mechanism for the NSU-built rotary engine, leaving a smooth, flat bottom when stowed. This made it feasible for two people to load the 130 pound Ski Craft into a car or onto a roof rack for a day of watersports. Period film clips show the ease of loading, unloading, and skiing behind the tiny boat; a passenger could even ride straddling the engine hump! Steering is accomplished by the skier shifting weight from side to side, acting on the long handlebars. A number of American importers operated on the west coast, and there were even concessionaires renting them for a few dollars an hour in California in the mid-60s.